When you receive a bouquet of fresh roses, preserve their beauty and fragrance by drying the rose petals. Dried rose petals are perfect for making potpourri, but they can also be used as dramatic embellishments in card making, as an organic element when pouring your own candles and soap, or even as confetti for weddings and bridal showers. There are several ways to dry rose petals, from microwaving them to pressing them between the pages of a book. Whatever method you choose, you may be surprised how easy it is to do, and how lovely the results. Before drying, allow the roses to fully open so that the petals are relatively flat, rather than curled up. 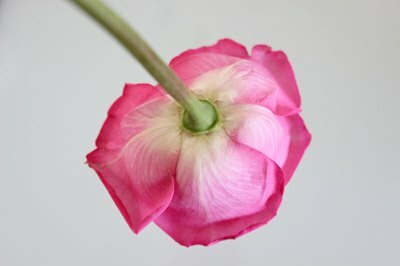 Remove the sepals from the base of the petals, and it will be easier to detach the petals. Handle the petals gently so you do not crush them. 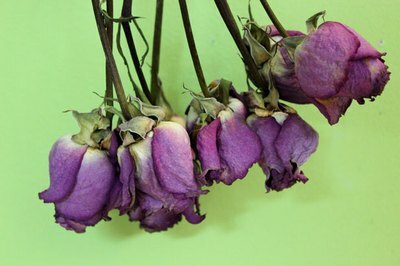 When you're in a hurry, drying roses in a microwave oven is the fastest way to preserve them. 1. Place a paper towel on a microwave-safe dish. 2. Arrange your rose petals in a single layer on the paper towel. Then place another paper towel on top of the rose petals. 3. Microwave the petals at full power for two minutes. 4. Remove the dish from the microwave oven, turn the petals over so they will dry evenly, and then microwave for another minute. 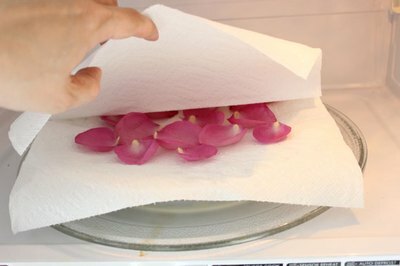 Tip: Microwave ovens vary, so if your petals still have a bit of moisture, return them to the microwave for 30-second increments until they are completely dried. 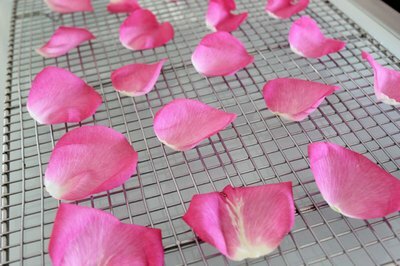 Drying rose petals in a regular oven is also relatively fast, while giving you the opportunity to check in on the petals periodically. 1. Set the oven at its lowest temperature, about 185 degrees. 3. 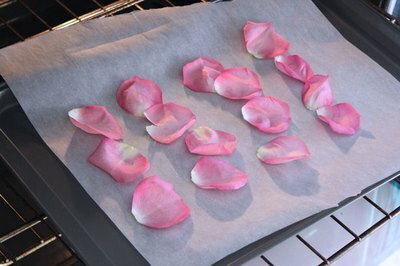 Arrange rose petals on the parchment in a single layer. 4. Place the rose petals in the oven and heat for about 30 minutes, turning the petals midway through the oven time. Tip: Leave the oven door cracked open so moisture can escape. Air drying rose petals takes about a week to 10 days, depending on the humidity. 1. Arrange your rose petals on a wire rack (like a baking cooling rack). 2. Leave to dry in a shaded area away from direct sunlight. 3. After about three days, check on the petals and turn them over to help them dry more evenly for the remainder of the drying time. Drying rose petals by pressing them between the pages of a book results in delicate, flat petals that are ideal for card making and mixed media art. 1. 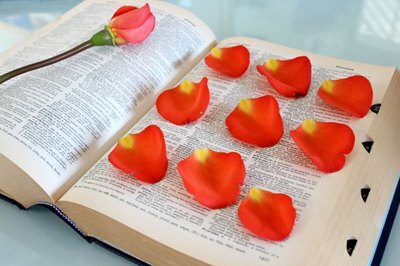 Find a large, thick book, like a dictionary, and arrange rose petals in a single layer within its pages. 2. Place a bookmark on the page so you remember where the petals are, and close the book. 3. Place other heavy objects on the book to help flatten the petals. 4. After about five days, check on the petals. You will see that they are wafer thin, with the look and feel of rice paper. If not completely dried yet, leave them within the book pages for another two to three days. Instead of drying individual petals, try drying whole rose buds. 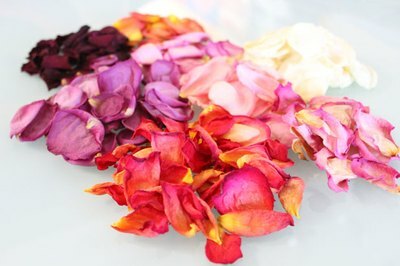 The whole roses are beautiful for dried arrangements and add extra texture in potpourri. 1. While the roses are still closed, remove the leaves from the stems. 2. Tie about six roses together with a string or rubber band, and hang upside down in a dark room. 3. It will take two to three weeks for the entire blooms to dry.